Taking care of rabbits. Diet, exercise, litterbox training and habits, veterinary care, everything you need to keep your bunny healthy for a long life. Leo dictated a change in topic from what was planned for today. I got his dinner greens ready for him and he had absolutely no interest in them. Now having no interest in eating for a rabbit can be due to not feeling well or having a digestive problem going on. It could be they have been given something they don’t like to eat. It could be they have already eaten too much of something else and aren’t hungry. In this case with Leo, I was suspicious it was in the not liking it category. We were reaching the end of a bag of kale. It was still within the Use By Date. The kale still looked green and not spoiled. However, it was a bit stronger smelling which I have noticed in the past can happen sometimes with kale as it ages just a bit in the refrigerator. I wasn’t sure Leo was going to like it. He didn’t. Fortunately, Blaine was already on the way home with new provisions. As soon as we put fresh kale in front of Leo, he began to eat right away. I thought the smell might turn Leo off because of something that happened once with Tigger and Shadow. We opened a new bag of greens which looked very fresh and lovely to us. There was nothing we could see or smell that would show any problems. When we put the plate down in front of them, they sniffed the greens and looked right back up at us. The looks on their faces would best translate to, “Really ?? ?” It was obvious that they picked up on something that was wrong that we could not. We threw out the bag, opened another one and then they were happy to eat. Getting the diet balance right for good digestive health in a rabbit is really important. They don’t always make it so easy though. As we have learned with our rabbits, they all have very different tastes and preferences for what they like to eat. It is a bit of a trial sometimes to get the right combination of what is good for them that they like to eat and will eat in the right proportions for a healthy rabbit diet. Tigger was our worst challenge and beyond finicky about eating in ways I don’t even want to remember now. I remember too many times in her life following her around with food trying to get her to eat. Shadow ate everything and I do mean everything. If he could sink his teeth into it and chew it, he considered it food. The challenge with him was keeping him eating true rabbit edibles and not clogging up his digestive system with things that weren’t even remotely food. We had to watch him like a hawk when he was running free. Thumper and Portia were our best bunnies with food, I don’t remember them being bad about eating or particularly fussy about anything unless they were ill.
Now there was one time we had a massive bunny food strike here. We received a new batch of timothy pellets and hay from a company that we had ordered from for years. When we served up the new pellets and hay to the rabbits, all three rabbits refused to eat them. Now Tigger I could understand as she had always been on and off finicky, but Shadow and Portia had never been fussy about pellets or hay. I called the company who put me through to one of their nutrition departments. The previous season the weather had been significantly different in their area in regards to the amount of rain during the growing season. That meant the hay was not exactly the same taste as past seasons and they were getting reports some rabbits were noticing the difference and not happy about it. Fortunately, we had a friend who had a bag of pellets from a previous year’s batch that was still within use dates. We mixed old pellets with new. We made sure there were multiple hay choices besides timothy out for grazing. Within two days Shadow and Portia were back to eating their timothy hay and pellets in normal amounts. Tigger held out for two weeks before accepting the new hay and pellets. During the two weeks, we had to have her in to the vet to make sure there wasn’t something else going on. We offered her other hays and more greens to try to make up for the hay and pellets she wasn’t eating. Fortunately she was not ill or losing weight. She was just being incredibly picky and slow about accepting the new batch. So little Leo is like Tigger in being a more of a bunny food critic than I would like. We are having to put lots of things in front of him repeatedly and throw lots of things out when he refuses to try them. If you have a picky bunny, you are probably going to have to try lots of varieties of things in hay, pellets, vegetables and fruits to be able to find out which ones the rabbit will eat. I remember a friend’s rabbit that she called the junk food bunny. She had a terrible time getting him to eat anything that was good for him. He only wanted the bunny junk foods: lots of pellets, sweets and treats. She had to really work to get him eating more of the good things, hay and healthy greens. So Leo will eat timothy pellets, but he won’t touch timothy hay. He will eat oat hay and orchard grass. Thank heavens there are a variety of different hays and grasses to try. Leo will eat kale but it is really hard to get him to eat any other greens. We have managed to expand him to spring greens and leaf lettuce and are working to see if we can get him to accept a wider variety. Although sweets / treats should be given in very small quantities, it can be very important to know which treats your rabbit likes best. With all of our rabbits if we thought they were becoming ill, a good test was offering them one of their treats. If they refused a treat, something was really going on and we knew we needed to figure out what to be able to help them. Sometimes that meant a vet visit if we had no clue what might be wrong. Other times, we knew from experience what to try to see if we could bring them back to normal. We have identified Leo likes fresh baby carrots and has his doctor prescribed limit of just 2-3 per day for his size. Tigger and Shadow went gaga over bananas and couldn’t stand fresh carrots. Leo has no interest in bananas and goes first for any carrots he is given. Leo also likes dried apples and papaya and some bunny biscuit treats we have. The dried fruits and biscuits bring on a bunny dance around the feet. So if we would ever offer those and aren’t getting the bunny dance, it would be a strong sign that Leo is sick. So first thing this morning we were off with Leo to the vet for a yearly well visit exam. His first two visits a year ago were a check up for his health right after we adopted him and then to have his neuter surgery. Thankfully Leo has been a very healthy bunny since then and did not need to see the vet this past year for anything. The vet we had taken him too initially had moved away from our area, so we needed to set Leo up with a new vet. We figured the new vet and staff would love him as they are quite fond of rabbits. The vet is new to Leo, but someone we had seen with Tigger, Shadow and Portia for many visits during their lives. As expected, the troll doll mop of Leo’s was a huge hit and could not be resisted by vet and staff. So Leo got lots of head pets which hopefully made the poking and prodding just a wee bit more acceptable. Leo weighs in with an adult weight of 4.2 pounds and is in good health. The biggest challenge the vet sees is making sure he eats enough hay for roughage and has good grooming to help prevent any hairballs forming in his tummy. We figured this would be the case and had questions about what would be the best diet for him and amounts of things based on his ideal size. The vet feels Leo is at the right weight. Since he isn’t a super active little bunny, we need to keep an eye on fattening foods and treats he likes being minimal amounts so that he doesn’t gain too much weight. Each rabbit brings their own challenges to their humans based on the rabbit’s individual personal likes and dislikes. Grooming is high on Leo’s list of activities to be avoided and he makes sure I know how much he hates it by either whimpering or chattering his teeth no matter how gentle I am. So will have to practice tough love about that and hope at some point Leo will reach a bit more acceptance of it. It is also going to be a bit tricky trying to evaluate if he is eating enough hay, since he likes to eat his hay in private when no one is watching him. The vet had suggested a measurement system. Leo does seem to like to eat hay when he is lying around, so I am thinking I will be following him around putting handfuls of hay wherever he flops to have it handy as a snack and then have a log of how many handfuls he eats per day. It was easier with Tigger and Shadow as we could have a hay bin and they hopped in and ate away not caring if we watched and we could tell how much they were eating pretty easily. Leo is more secretive. 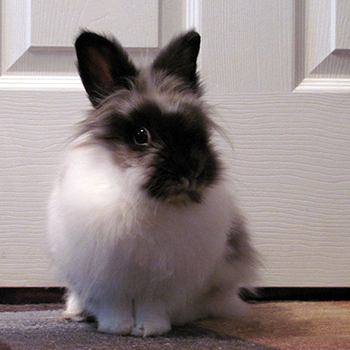 So before we had Leo, I had seen some pictures of Lionhead rabbits and knew they had manes. I also knew they could be single or double maned, but had no idea what that actually meant. Seeing Leo’s picture and then seeing him in person, I thought the mop of fur between his ears was super cute, but he didn’t have the thick ruff of mane around the head that I had seen with some Lionheads. You can see in the top picture what I mean. Except for the between the ears mop, his fur was pretty short. In the time we have had Leo, I have learned that cute mop of fur between his ears is also called a “fringe” or “wool cap”. Whatever you call it, it just always reminds me of the hair on a troll doll. I loved playing with those troll doll mops of hair. Messing with Leo’s fringe of fur is just as much fun. He doesn’t mind because it means he is getting his head petted which he loves. Leo was thought to be a year and a half old when we got him. We learned pretty quickly that could not have been true. First, the teenage hormones hit with a bang within days of bringing him home. Second over the first two months we had him, he was still growing. Leo didn’t have his adult fur coat until a few months later. You can see in the second picture that Leo in addition to that mop between the ears now has the around the face mane too. His isn’t as pronounced or thick as some I have seen in pictures of other Lionheads, but it is there now. After he got his adult coat, I noticed what seemed to me like a strange fur growth pattern where the fur from his waist and around his behind on low on his sides had grown to where it was dragging on the floor. It looked weird to me since the fur along his backbone and to the sides of his backbone was much shorter. I was describing this on Etherbun and that is when I learned that Leo is double maned. I had assumed that a double mane must mean a thicker or second-growth of fur around the head. In reality, a double maned Lionhead has a mane around the head and a “skirt” of fur that runs around the lower sides and back of the body from waist to waist. Skirt is actually a very good description of that fur. You can see in the last two pictures how the skirt can really hide his tail and feet. So living with Leo has been a bit more challenging than we had expected. Since the shelter thought he was over a year old, we thought the fur coat we were getting in the first picture was the adult fur coat. We weren’t expecting all the fur in the lower pictures. The Lionhead coat has some decided challenges. First the shedding is awesome with little poofs of white fur floating around everywhere. I’m thankful I’m not allergic to rabbit fur. That skirt mane is the second challenge. The skirt drags everything around it comes in contact with. It is like having a living, breathing Swiffer broom in action. Everything on the floor he comes in contact with gets moved around all over the place and deposited where he stops. So little piles of fur, hay, paper or cardboard he has chewed off of boxes, all get swept up by the skirt and then redistributed all around the room. If my living Swiffer could learn how to deposit what he gathers up straight to a trash can, cleaning would be so much easier. I’ve found that a weekly comb out of Leo is necessary. His head mane and body fur on his back are usually in good shape, but the skirt mane is another story. The skirt tends to get tangled and sometimes holds on to bits of hay. If not attended to on a weekly basis, it would start to clump up and begin to form fur mats. He begins to feel like he is attempting to grow multiple tails on his hind end. Leo is not a happy camper about the grooming. He really hates it and no matter how gently I do it, he starts off with the heavy breathing, bugged out eye look the minute he is picked up for it. If he has some tangled areas, it can take a few minutes to gently work through them and he will sometimes start a pitiful crying sound which makes it really hard to keep grooming him. I am hoping he will grow more accustomed to handling over time. Tigger would do the same thing when very little, chattering her teeth when we had to do things for grooming or medications. As she got older, she finally seemed to realize that we weren’t seeking to harm her every time we picked her up. She still didn’t like it, but at least she stopped with the chattering teeth. Leos Lionhead status is clear when looking at his two manes. My understanding is that a double mane Lionhead needs to have both parents be Lionheads. What confuses me though is that Leo’s adult size is above and beyond the size of most Lionheads. He was three and half pounds when we got him. Since Lionheads are not usually above four pounds that was one reason we at first thought the shelter might have his age set right. However, Leo was still growing and is now somewhere in the four to five pound range. So I am not sure if he had some recessive gene for a bigger size than normal. We appear to have a giant Lionhead. It is kind of weird to be thinking that because Leo is a small rabbit. He is just very very big for a Lionhead rabbit. When Leo hens up to sleep, he has a bit of a fluffy marshmallow with chocolate sauce look which is so cute. I haven’t caught a picture of him like that yet and will have to try for one in the future. One thing is for certain and that is that his fur is the softest rabbit fur we have ever felt. 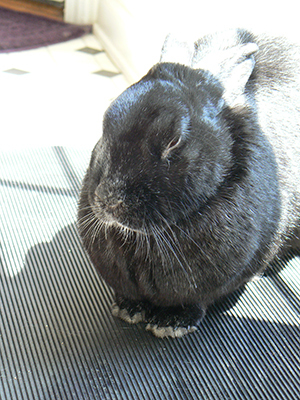 Previous rabbits Portia and Shadow were both fur breeds. Portia’s Chinchilla fur was soft due to its thickness. Shadow’s fur was Havana and it was the satin sheen of his fur that was notable. Tigger who was not a fur breed actually had the softest to the touch fur because it was such a baby fine fur. Leo beats out Tigger having even softer fur. It also amazes me the whiteness of his fur and in spite of dragging his skirt around everywhere just how clean the fur stays. I guess Leo and I together do a good job of keeping him well-groomed. Later this week Leo is scheduled to have his yearly check up with a new vet. I’m going to see if she has any better suggestions for making his grooming routine more acceptable to him. The last year and a half of Shadow’s life, he had trouble with allergies. During the spring and fall seasons when humans would be sniffling, sneezing and having a post nasal drip, Shadow would be sneezing too. We could tell he was also experiencing a post nasal drip, because like many humans, he would put his nose up higher in the air, stretching out his neck and then we would see him swallowing. Shadow started to lose weight during the allergy seasons. Blaine and I both have allergies so we could sympathize with a rabbit who either was dealing with things not tasting right or having trouble chewing, swallowing and breathing at the same time. He went in to the vet at least every six months and we learned the dose of antihistamine to give him as needed. We monitored his weight and watched his eating more closely. On the vet’s recommendation, we added some alfalfa hay back in to his diet to help him keep from losing more weight and put some weight back on. We also started to feed him some old-fashioned oats as a treat from time to time and he appreciated the taste change of that too. Tigger in old age was packing on the weight, so we would sneak tasty treats to Shadow when Tigger wasn’t around to help perk up his appetite while keeping her access to treats down. The difficulty with allergies in humans and animals is that the excess fluids that sit around can lead to infection. So we kept on the watch for any signs of a sinus or inner ear infection: teary eyes or mucous in the eyes, blocked tear ducts, swelling of the eyes or around the eyes, wet nose or mucous around the nose or on the paws from rubbing / blowing his nose on them, holding the ears close to the head, pawing at the ears or shaking his head a lot. We also kept on the watch for any signs of respiratory distress or infections: again wet nose or mucous around the nose or on the paws, trouble breathing, wheezing, not moving around as much or lack of appetite. The last six months of Shadow’s life, we dealt with a round of on again off again respiratory infections and he was on and off antibiotics on a regular basis. The vet was very honest with us that his care at that point was hospice care. Shadow was too old for some tests or treatments to be done safely anymore. His care was focused on keeping him comfortable and happy. He would have some times when his breathing was more labored due to congestion. Most of those times did tend to hit on evenings and weekends when the vet was not available. At those times, we did for him what we do for ourselves to ease our own congestion. We would turn on the shower with water warm enough to create a warm mist in the air without it being a hot sauna like steam. Once we had the bathroom air nice and misty, we would turn off the shower and take Shadow in for 5 to 15 minutes depending on how well he tolerated it. The first time it scared him, but after a few minutes we could see him swallowing and knew it was helping to clear some of his congestion. After that first time, he was more at ease being there and each time helped him breathe more easily again. We double checked this treatment with the vet and she suggested continuing with it as needed and also adding a humidifier or mister to his main living area. She said that if these treatments along with the antibiotics didn’t continue to help ease the congestion that we might need to add some inhalation treatments. Inhalation treatments weren’t needed for Shadow. The misty bathroom along with the added moisture of the humidifier helped to keep his congestion under control. It might seem like this time period in hospice was a really sad time. It was in the sense we knew our time with Shadow was nearing an end. It was also a very happy time, because Shadow was a sweet and very happy rabbit who was still quite active, bouncy and playful when he was feeling like himself. He was his happy self most of the time until just that final week when things finally started to really shut down for him. We had so many fun times with him in those final months, enjoying his play and caring for him when he needed our help. Tomorrow a gallery of images of Shadow and next week begins the stories of Portia and the challenge of bonding Tigger and Shadow. When Shadow became so ill with the ear infection and needed months of antibiotic treatment, it was a learning experience not only in the diagnosis, but also in how to handle giving him the needed medicine. At first when he was really ill the first couple days and needing shots, we used the means of holding a rabbit down that I had first learned with my family’s first rabbit, Thumper. The vet had taught us to hold him flat to a table with pressure along the spine and shoulders to keep him from flipping and injuring his spine. It is a good idea to make sure to have your vet show you how to immobilize your rabbit for treatments at home if it is ever needed. However, as I had written before after a couple of days of shots Shadow was well enough that he could flex his muscles and bend the needle even though he couldn’t move to get away. We switched over to a by mouth antibiotic that was given by syringe into the side of his mouth. Since I had more previous experience holding squirmy little bodies, nursing both rabbit and human babies, we started out at first with me holding Shadow immobile on a table so that Blaine could syringe the meds into him. Unlike Thumper and human babies, Shadow was extremely athletic and his hind legs were incredibly strong. As he started to regain a bit of his strength on the meds, he was able to kick back with his back legs. Let me tell you even with a small sick rabbit, those back legs are incredibly strong and when he kicked me in the stomach, I thought I was going to lose breakfast. So, we tried the other method suggested for rabbits of using a towel to mummy / burrito wrap the rabbit so that only the head is free. That is when we discovered that Shadow was like many humans and clearly had a serious claustrophobic streak. He went completely berserk, thrashing, biting, and scratching. It was nearly impossible to safely get him back to the floor while we regrouped. It was clear if we tried to stick with the mummy / burrito idea, someone was going to get hurt, possibly all of us. It occurred to me that maybe just as many humans tolerate getting MRI’s with a more open style of machine, that maybe Shadow could be treated with a firm but more open style of holding. So, I put on and buttoned up a denim jean jacket with the collar turned up for some protection if Shadow tried to scratch or bite and picked him up and held him up on my shoulder baby style with his head facing back over my shoulder. I had one hand firmly on the back of his head and shoulders with my forearm along his spine and the other hand firmly holding his bottom. If I felt him start to move, I pressed my forearm and hand more firmly along his spine and shoulders to hold him steady. Now this position isn’t something that would work at all well for lots of rabbits, some might try to go over the shoulder, but for Shadow it worked. The more open hold clearly made him feel less threatened. He would gnaw on the jacket in protest between getting his meds syringed in a bit at a time, but he didn’t go nuts like he did with the towel wrapping. Over the months he needed to be medicated, we were able to control the situation and safely get him the meds he needed without hurting him or creating the terror reaction the towel wrapping tries had brought on. Watch for ear positions that regularly stay like this! This is part two of the story of Shadow’s early illness that I wrote about on Thursday. After nursing Shadow through a rough Sunday, we loaded him up first thing Monday morning to head off to meet the new vet who had so kindly returned our call Sunday afternoon to provide assistance by phone even though we weren’t current patients. One of the first questions the vet had asked us on the phone the day before about Shadow was whether he was an outdoor or indoor pet rabbit. She told us later on in our first visit that was a key question for her in deciding what / how much help to offer us. Her experience was that owners who kept their rabbits outdoors usually did not want to pay for or follow through with treatment if the rabbits became ill, while owners who kept their rabbits indoors were more likely to accept and follow her treatment suggestions. When the vet started to look Shadow over, she noticed something right away that we had missed. He was holding his ears funny, one was partially up with the other flat down against his head. I was used to the “rabbit ears” of a rabbit sometimes having one ear up and one down as they rested, but at the same time sometimes tuned in to things around them. I hadn’t really paid any attention to watching Shadow’s ear positions on a regular basis as a guide signalling that something more sinister might be going on. Even before taking a look inside his ears, the vet believed we were dealing with an ear infection. Looking inside Shadow’s ears, the vet saw that both eardrums were extremely red and one was bulging. It was clear he had an inner ear infection. She didn’t stop there though and gave him a thorough head to toe exam making sure that seemed to be the only problem point on a physical exam. Not finding anything else that seemed wrong, she wanted to put him under anesthesia to poke a hole in the bulging eardrum allowing it to drain and to get an x-ray of Shadow’s head to try to determine if the infection was confined to his ears or perhaps had spread beyond the ears into the brain which would be much more serious. Knowing that anesthesia can be tricky for rabbits and that Shadow was very weak, we agreed knowing that he might not wake up. We recognized he needed a good diagnosis for the best treatment and hopefully a recovery. Fortunately all was good news with the anesthesia and x-ray. There didn’t appear to be any spread of infection beyond the ears and the vet was also able to relieve the pressure on the bulging eardrum. When the vet learned I had trained and worked as a pediatric nurse in the past, she suggested that we start out his treatment with daily antibiotic injections at home to give him the strongest early treatment possible. I was terrified. It had been years since I had worked as a nurse and given any shots. The smallest patients I had given shots to were twice Shadow’s size and baby human anatomy isn’t disguised in layers of thick fur. I did want to give him the best chance, so the vet showed us how Blaine needed to hold Shadow and where I needed to give the shot. We went home with a plan for daily shots for a week with a follow-up visit. Initially, Shadow was still very weak, so the first two days of giving the shots weren’t too hard. Then he started to feel a little better and even with Blaine holding him flat on the table, Shadow was able to flex his muscles hard enough to bend the needle when I gave him the shot. I called the vet and said I thought we were risking having a needle break in him if we continued on with the shots. So she had us switch to oral doses for the remainder of the week. Shadow continued to gain strength and by the end of the week seemed normal again and his checkup went well. So far so good, but not for long. Within a week, his bad balance was back and he was staggering around and weaving looking like a drunk bunny. We headed back to the vet for Plan B. It was clear that the first antibiotic had not fully knocked out the infection. So the vet switched to another and said the plan this time would be to keep Shadow on antibiotics for two weeks past the time symptoms disappeared. That turned out to be a very long time. It took two months of watching Shadow staggering around looking drunk. We wondered all the time whether we were doing the right thing, whether this was as good as he would ever be again, or whether he would develop resistance to the antibiotic or a stronger infection from being on the antibiotics so long. It was hard to watch Shadow struggle to stay balanced. He had been such an active athletic rabbit. Watching his difficulty and not knowing if that struggle would now perhaps be permanent for the remainder of his life was tough. Then at the two months into the second set of antibiotics, the symptoms cleared up and Shadow was able to stand and move without any loss of balance or staggering in his movements. We began the plan to keep him on the antibiotics for another two weeks to try to be more certain that the infection had been fully cleared this time. It was looking really good for Shadow to come off the antibiotics and be fully returned to normal and then we noticed that Tigger was holding her ears funny like Shadow had been when he was first diagnosed. It was off to the vet with both rabbits. Sure enough, just as Shadow was ready to come off antibiotics, Tigger had developed an inner ear infection. We had kept Shadow and Tigger in separate side by side cages to allow them to see each other, but had kept separate run times. Shadow’s illness had rendered him really irritable and the one and only time we had tried to allow them to play together, he had growled at Tigger and chased her away. So now the vet proposed Plan C. This was the really hard one. The vet wanted Tigger and Shadow to be housed in completely separate areas of the house with no contact until Tigger was clear of infection. She wanted Shadow to stay in the area he was used to since he was the weakest and that area had the most run area to allow him the best exercise ability to try to fully regain his strength. Shadow would come off the antibiotics as planned and Tigger would be on them until her infection cleared. The vet told us if we didn’t do this, it was likely we would be facing an endless round of the rabbits passing the infection back and forth. Even doing this, repeat ear infections were still a possibility since rabbits like some humans can have a genetic tendency to that type of infection. We have a tri-level home. Shadow got the second level living room, while Tigger got the office and hallway on the third floor. Over the next month, Shadow regained his strength and once again became the strong athletic rabbit he had been in the past. Tigger was miserable and it was clear it wasn’t just the infection. She was in a completely unfamiliar place and all alone. When her infection cleared after a month, we moved both rabbits back to side by side cages in the living room with separate run times. Working on bonding them again would be for a future time once we were more sure of their health. We were very fortunate and Shadow never had an ear infection again. Tigger did have some repeat ear infections, but only about once a year for a few years which cleared up easily with antibiotics. Fortunately for us, none of the worst case scenarios ever came to be. The one thing we learned was to really pay attention to a rabbit’s ear positions. They do move their ears around a lot, but the key to spotting a problem early is if they are keeping their ears partially or fully back much longer than their normal or pawing or scratching at their ears much more than normal. The illness of Shadow and then Tigger taught us just how subtle the clues can be between normal behavior and the beginning of a serious illness. So, the best thing to maintaining good rabbit health is human caregivers who really know what their normal behavior is to recognize early when things seem off. We missed it early on because we weren’t aware to look for this problem and we had just moved into our house and were still busy getting things settled and not as observant as at other times. A slight change of plan here to keep this post brief. Until little Leo’s hormones finally calm down, I need to start scheduling my writing time for his nap time. Usually, I have been writing after Blaine gets home from work so that he can distract Leo from his pursuit of me. Unfortunately, Blaine has come down sick with a cold / flu today and has been sleeping most of the day. It is now two weeks since Leo’s neuter, but his hormones are still raging. Leo is a leg man, an arm man, an anything he can reach rabbit man. My legs are getting cramped trying to keep them up out of his way and he is at times chewing on my chair in frustration. Leo at the moment is a poster bunny for why a house rabbit needs to be neutered. We are thinking that the reason we were given for his being turned in to the shelter (owners working long hours) might not have been the whole truth of the matter. Or he may be much younger than was thought and just hit the full hormonal burst right as we adopted him. Any way you look at it though, the love bites that accompany Leo’s rabbit embrace are quite painful if I fail to evade him. This really isn’t an ideal way to start off our bonding process. We are glad to have rescued him, but so sad it was necessary because so many don’t properly understand the needs of a house rabbit. Our vet told us it would take 1-2 months for his hormones to settle down. I am guessing it is going to be the full 2 months at this rate. When Shadow was just a few months over a year old, we woke up one Saturday morning and realized right away that something was very wrong. He didn’t want his morning treat or to come out of his cage. We made arrangements to get him to the vet right away and felt fortunate that the vet had Saturday morning hours. Unfortunately, most likely since the vet was only open half a day on Saturday and we were describing what seemed like stomach problems, the vet examined him for that and prescribed treatment for stasis. We took Shadow home and began the recommended diet and treatments. On Sunday morning, Shadow came out of his cage right away and at first we thought that was a good sign. Then he bent down to eat out of a bowl and fell over on the floor and was rolling around. It was clear that something was very wrong with his balance. We realized then the vet had not done a full head to toe check of him the day before and the proper diagnosis needed had been missed. We got on the phone calling every vet we could find and contacting rabbit people we knew via phone and email trying to find some assistance since we weren’t sure what was wrong or how to help Shadow. The emergency animal clinics that were open had no exotic vets on staff or call. The exotic vets had no Sunday hours, except for one that was more than an hour away. The air conditioning on the car had just gone on the fritz and we hadn’t had a chance to even schedule an appointment for that yet. We knew we could not take Shadow such a long distance in the Georgia heat with no air conditioning in the car. We would trade one emergency for another if we tried. We only got the answering machine for one exotic vet nearby who indicated she had emergency call back, but only for current patients. We had nothing to lose and Blaine left her a message anyway. The exotic vet we left a message for did call back and we were so appreciative. She said normally she would not call non patients back, but there was something about what Blaine had said that made her decide to make an exception. We described the problem with Shadow’s appetite and activity being off the previous day and now his falling over and rolling around when he bent his head to eat. We were asked a lot of questions and told that it sounded like either a problem with an ear infection or a neurological problem with seizure like activity. The vet thought it was more likely an ear problem from what we described and that the falling over was due to dizziness. She suggested we put him back in his cage and make that as safe a space as possible since he was experiencing balance problems. She wanted us to keep trying to get him to eat and drink and then bring him in first thing the next morning on Monday to be seen as a new patient. Tigger and Shadow were bonded at that time and sharing a cage that was two cages linked together. The vet suggested we separate them so that we could better monitor Shadow and so that Shadow would not be tripped by Tigger or accidentally hurt her by falling on her. We separated the cages into two. Then we removed things from the floor of what would be Shadow’s cage, toys and such that were loose and that could trip him or that he could fall on. Then we put him in his new cage for one. When he tried to eat out of his bowl, he fell over in the cage again and was rolling around trying to get back on his feet. Shadow was wild-eyed terrified. When he was able to get back up, he hopped to the back of the cage into the litter pan and laid down propped up against the side. Thinking about the problem likely being dizziness, we got some freshly washed greens which would give him both food and some water and held them out to him right where he was laying so he did not have to move his head. He was so eager to eat those, it was clear he was hungry and thirsty. We thought some more about the problem and realized it was probably a good idea to keep him in his litter box as much as possible. It was a safe space if he fell and the sides allowed him to prop himself up and rest his head to keep it steady. The litter box fit the cage side to side in the back. We realized we had three cage walls to work with surrounding him. We moved his hay rack, water bottle and food bowl so each was on one of the walls around his pan. We positioned each so that they were right on a level even with his head so that he did not have to move his head up or down to eat or drink. That was a success and Shadow began eating and drinking again. We continued throughout the rest of day and evening to also hand feed him some greens. By evening he was still a very sick rabbit. It seemed he was just a tiny bit stronger since he was able to eat and drink again now that we had things so that he didn’t have to move his head and risk losing his balance. He continued resting comfortably in his litter box keeping himself propped up. We got his carrier ready to take him in to the new vet first thing the next morning.